“Taking their time to give a great overall sales experience”. “I have used Haynes for over 30 years and rate them very highly. They have been fair, courteous and very professional”. “I have driven a Ford car for the last 20 years and as always the staff have been a credit to the Ford organisation. When you think that the service by the staff have reached a peak they come back and improve in everything”. “My experience with Haynes was excellent. This was due to the brilliant service given to me by the Salesman. He took so much time to explain everything fully and always went that extra mile to make you feel special”. “I cannot fault the service. I was given friendly and efficient service”. 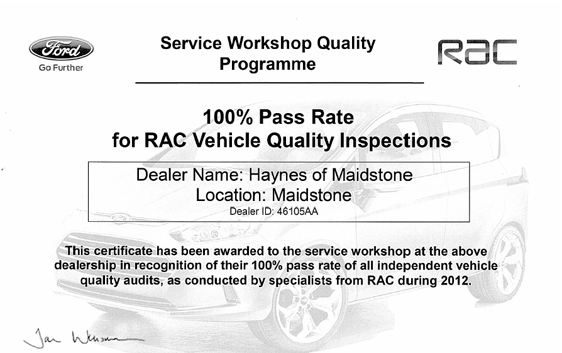 “Haynes provide a first class service which many other garages would do well to copy”. “I found the Salesperson excellent. We have nearer Ford dealerships but used Haynes because of their good reputation”. “Experience was good and very friendly approachable staff”. “An excellent overall experience that was hassle free”. This entry was posted in feedback on January 31, 2013 by Kay Bangle.